• All known viral infections affect certain organs of a person, and the immune system always protects a person rationally - he finds these disease-causing viruses, and comes to fight with them. But HIV infection affects the human immune system itself, and makes it act irrationally. Protective cells of the immune system are sent to fight HIV infection - and become an incubator for its reproduction! Therefore, in the fight against HIV infection, the internal defense mechanisms of a person are rendered helpless, and medicine has to rely only on external influences on HIV infection in the human body with drugs or vaccines. • However, HIV infection is distinguished by extremely effective mutation ability. After a few months of successfully destroying its original clone in the human body, its place is taken by a mutant clone. This makes traditional methods of combating HIV infection with drugs and vaccines useless. Even extremely effective for the destruction of the identified clones, these traditional tools cannot stop the rapid replacement of the destroyed clones with new mutants. In our work, we abandon traditional medical and biological means of combating HIV infection and offer fundamentally new cybernetic methods. More precisely, we offer colleagues, doctors and biologists to get acquainted with these original methods developed by the artificial intelligence of our computer. The main result of the book is a three-fold prolongation of the life of an HIV-infected patient by methods of precision treatment based on the cybernetic model of HIV infection. The computer, calculating the treatment program by the criterion of maximizing the lifetime, found an unknown treatment regimen, consisting in organizing the fight between the two modifications of the virus among themselves. This project is a continuation and development of the work of American mathematicians Dr. GF Webb and Dr. D.E. Kirschner [1,2]. The goal of the project is to extend the life time of the patient affected by HIV infection to the greatest extent possible. The means of solving this problem is the computer optimization method . This Research problem was started in 2000; the results have been published [4-13]. Biology studies the composition of the organism and the interaction of its individual parts. Cybernetics describes the whole aggregate of all these interactions by mathematical equations, and solving these equations allows one to know the functioning of the organism as a whole. If you compare the human body with a musical instrument, you can say that biology analyzes and studies the construction of this tool, and cybernetics teaches you to press the necessary keys and play musical melodies on it. Vr - The concentration of the immunodeficiency virus resistant to chemotherapy. V(t) = VS(t) + Vr(t) - General population of the virus at time t.
The functions η1(t) and η2(t) describe the effect of drugs on the virus. Function η1(t) describes the suppression of chemotherapy by the process of infection of CD4 + T cells. Function η2(t) describes the suppression of the inflow of the virus from the lymphoid system. It takes into account this fact that the therapeutic drugs do not act on the resistant group of the virus and on the CD4 + T cells affected by the resistant virus. In more detail with these equations, the dynamics of the development of HIV infection in the human body can be seen from publication No. 12, available on the Internet . 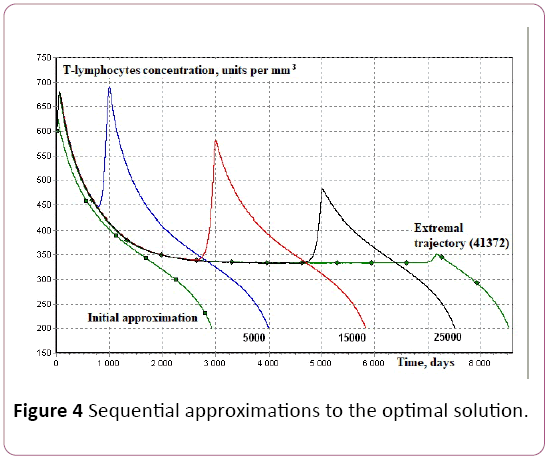 Calculations on the dynamic model consist in choosing the best, in terms of the effectiveness of treatment, the day and hour for the appointment, or the cancellation of each of the two drugs. These calculations are repeated many times, and the formation of a treatment program for a period of 24 years by days and hours requires tens of thousands of complex calculations. A detailed description of the complex methods of these calculations, which in mathematics is called the theory of optimal processes . Therefore, we shall only give the results of these calculations presented in figures and tables. In Figure 1 shows the dynamics of the disease, calculated according to the mathematical equations. Figure 1: A typical course of HIV infection without treatment. Here the bottom line shows at first a slow and then rapid development of the HIV virus in the patient's body. The top line shows the death of protective T cells of the immune system, culminating in the death of the patient 7 years and 10 months after the onset of the disease. In Figure 2 shows the dynamics of treatment of HIV infection with two strong chemical preparations. The top line demonstrates the exceptional effectiveness of such drug treatment - the virus is almost completely destroyed in the first 20 days of treatment. 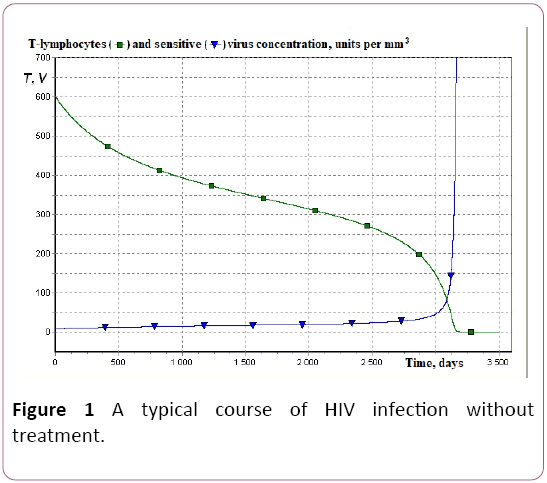 Figure 2: The course of HIV infection with continuous treatment 100 days. But this result is not counted in favor of the patient. The place of the destroyed top virus immediately takes its bottom copy, to which these wonderful drugs no longer work and Figure 3 shows what happens if you continue to treat the patient with these strong chemicals – initial (bottom line) virus putted to death. But modified (middle line) clone of the virus kills the T cells of the patient (top line), and himself - 8 years after the start of treatment. 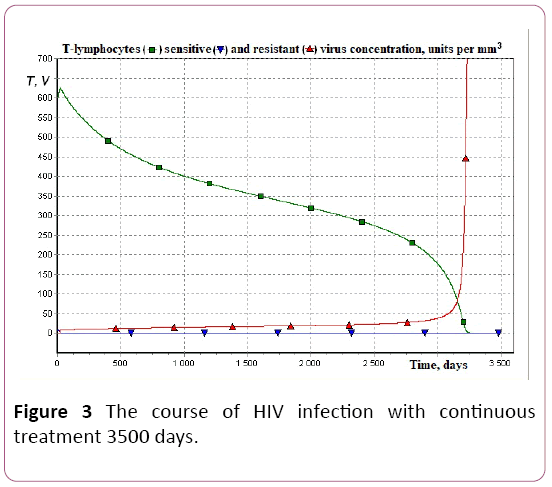 Figure 3: The course of HIV infection with continuous treatment 3500 days. That is, this medical treatment is extremely effective - it extends the life of the patient from 7 years 10 months to 8 years - for as long as 2 months! The following Figures 4, 5 and Table 1 illustrate the effectiveness of our cybernetic intervention in this problem, in which medicine with its tablet weapon is defeated. Table 1: Comparative result of treatment programs. Figure 4: Sequential approximations to the optimal solution. 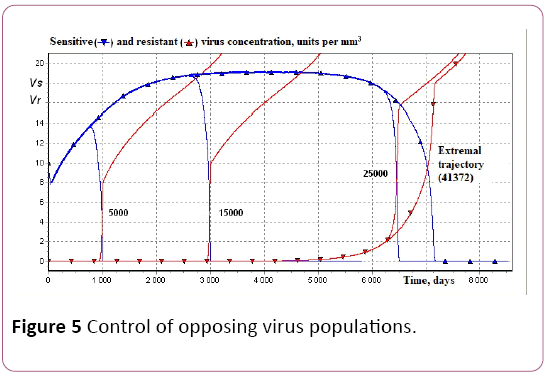 Figure 5: Control of opposing virus populations. The left line Figure 4 shows the death of the cells of the immune system and the time of death of the untreated patient. The 2nd, 3rd and 4th lines shows how long the life of the patient is after 5000, 15000 and 25000 iterations of our numerical optimization method No 3. The last line shows the constructed optimal solution. The lifetime of the patient between the first and last lines is 16 years! Table 1 shows the main results of calculations. As initial approximations for the calculation of optimal regimes in all calculations, Fig. 4 the mode of Section 2 of this Table was used (with treatment with two drugs during the first 3500 days). The formation of the optimal recipe in Section 4 required 41,372 iterations. At the same time, when using the initial approach of the regime without the treatment of Section 1, in order to obtain the same result in Section 3, only 5,228 iterations are required. Comparisons of medical and cybernetic treatment regimens by the number of medications used are also indicative. The extreme program of Section 4 requires twice less than the first drug, and 10 times less than the 2nd drug, than the medical program of constant treatment of Section 2. And in the program of Section 3, the computer needed to properly dispose of only 21 tablets of the 1st drug, with complete abandonment of the 2nd drug. It should be emphasized that this phenomenon is not found in medicine or in technology. In our cybernetic regimens, the AIDS patient lives longer, the less it is treated! Figure 5 explains the biological law, self-discovered and used by the computer in this non-standard method of treatment. This law is shown in Figure 5 left and right intersecting lines. The computer does not immediately kill the original left virus, but allows it to live 1000, 3000, 6500, 7000 days, with the condition that it suppresses its right copy all this time. And the patient, due to a quarrel between his two deadly enemies, gets 16 years of life! It can be said that our computer independently discovered the ancient principle of politics, which is given as an epigraph to this Addition. But this is from the point of view of "diplomatic" cybernetics. And from the medical point of view, it is obvious that no current and future doctor's consultation is such a recipe, which three-fold, from 8 to 24 years prolongs the life of a patient with AIDS, cannot be discharged. On this basis, it can be argued that our computer has a superintelligence, superior in strength to the natural intelligence of man. We emphasize that this phenomenon is fundamentally different from the known realizations of computer "artificial intelligence". In all known examples, a person lays in the computer the required algorithms, which the computer only realizes with its speed. And the developers of this project did not put this intellectual program into their computer, and its own invention cannot be preached. They themselves could not have thought of such a law of controlled biology. You, readers, with your natural intelligence, cannot do this either. This book is at the crossroads of three areas - cybernetics, medicine and biology, so its results should be noted in all these areas. The author did not accidentally cite a space rocket as an example, because the management of space ships is his main specialty. And the problem of fighting HIV infection is considered in this book as the management of a "rocket" - a fragment of the immune system in the vast space of the human organism. The cybernetic results here are recording - our precise control of the immune system for more than two decades is second only to the 30-year program of the American Voyagers. The use of the methods of this book in medicine for the treatment of living people is still impossible. Optimizing methods of the book require such high accuracy of mathematical modeling of a living organism, which is unlikely to be available in the near future. For biology, the results of our book are fundamentally important. We have shown that the virus of HIV infection can be suppressed by a biological opponent. The artificial intellect of our computer has found a method of protecting the organism, which is very similar to the already known method of vaccination with a weakened infection. But it is hardly feasible to manufacture a vaccine from the HIV virus. So, biology must be found in nature, or create an artificial virushunter that will be safe for humans, but will enter into a fight and win the virus of HIV infection. Cybernetics has received models of HIV infection in biology, and now returns the biology of the baton of a 30-year scientific marathon against this deadly danger of mankind. Webb GF, Kirschner DE (1996) Using mathematics to understand HIV immune dynamics. Notices Amer Math Soc p: 191-202. Webb GF, Kirschner DE (1997) Resistance, remission, and qualitative differences in HIV chemotherapy. Emerging Inf Dis 3: 273-283. Velichenko VV (1966) A numerical method for solving optimal control problems. USSR Computational Math Math Phy 6: 34-50. Velichenko VV, Pritykin DA (2001) Social studies, science and the dynamics of HIV-infected person's immune system and optimal treatment strategies. Proceedings of the XII Internat. Conference of the Baikal, Irkutsk 6: 110-117. Velichenko VV, Pritykin DA (2001) Artificial intelligence and social dynamics HIV-infected person's immune system. Intelligent systems. Moscow State University 6: 5-24. Pritykin DA (2003) Human immune system interaction with HIV: Dynamics and control. Collection of scientific works “Problems of Fundamental Applied Math p: 78-94. Velichenko VV, Pritykin DA (2006) Control of the medical treatment of AIDS. Automation and Remote Control 3: 166-185. Pritykin DA (2007) Optimal control in a mathematical model of HIV-infection. Ph.D Thesis, ÃÂoscow, MIPT. Velichenko VV, Pritykin DA (2006) Numerical methods of optimal control of the HIV-infection dynamics. J Computer Sys Sci Int 45: 894-905. Velichenko VV (2008) On the problem of computer intelligence: solution to the problem of survival, proposed and implemented a computer. Abstracts of the XV Internat. Conference "Problems of Theoretical Cybernetics", Kazan p: 14. Velichenko VV (2009) By the methodology of artificial intelligence – Abstracts the 2nd Internat. Scientific Conference "Philosophy of Mathematics." M. Moscow State University p: 301-303. Velichenko VV, Pritykin DA (2009) Using of artificial intelligence and computer technologies for developing treatment programs for complex immune diseases-I. Fundamental Applied Math 15: 21-42. Velichenko VV, Pritykin DA (2011) Using artificial intelligence and computer technologies for developing treatment programs for complex immune diseases-II. J Math Sci 172: 635-649.